Border Cave is a rock shelter on a steep slope (scarp) west of the Lebombo Mountains in KwaZulu-Natal near the border between South Africa and Swaziland. Its opening lies around 600 meters (~2000 feet) above current sea level. Border Cave has a continuous stratigraphic (study of rock layers) record of human and pre-human occupation spanning about 200,000 years. Anatomically modern Homo sapiens skeletons together with stone tools and chipping debris were recovered. Dating by Carbon-14, amino acid racemisation and electron spin resonance places the oldest sedimentary ash at some 200,000 years. The paper titled Early evidence of San material culture represented by organic artifacts from Border Cave, South Africa was authored by Francesco d'Errico, Lucinda Backwell, Paola Villa, Ilaria Degano, Jeannette Lucejko, Marion Bamford, Thomas Higham, Maria Perla Colombini, and Peter Beaumont. "The dating and analysis of archaeological material discovered at Border Cave in South Africa, has allowed us to demonstrate that many elements of material culture that characterise the lifestyle of San hunter-gatherers in southern Africa, were part of the culture and technology of the inhabitants of this site 44,000 years ago," says Backwell. The international team of researchers, led by Francesco d'Errico, Director of Research at the French National Research Centre, dated and directly analysed objects from archaeological layers at Border Cave. "They adorned themselves with ostrich egg and marine shell beads, and notched bones for notational purposes. They fashioned fine bone points for use as awls and poisoned arrowheads. One point is decorated with a spiral groove filled with red ochre, which closely parallels similar marks that San make to identify their arrowheads when hunting," says Backwell. A lump of beeswax, mixed with the resin of toxic Euphorbia, and possibly egg, was wrapped in vegetal fibres made from the inner bark of a woody plant. "This complex compound used for hafting arrowheads or tools, directly dated to 40,000 years ago, is the oldest known evidence of the use of beeswax," says Backwell. The study of stone tools discovered in the same archaeological layers as the organic remains, and from older deposits, shows a gradual evolution in stone tool technology. Organic artifacts, unambiguously reminiscent of San material culture, appear relatively abruptly, highlighting an apparent mismatch in rates of cultural change. This finding supports the view that what we perceive today as "modern behaviour" is the result of non-linear trajectories that may be better understood when documented at a regional scale. 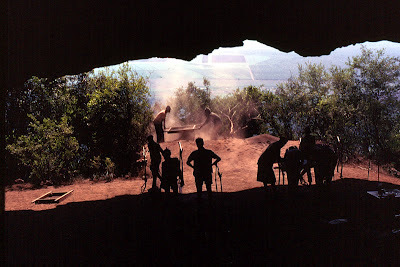 Another paper, titled Border Cave and the Beginning of the Later Stone Age in South Africa will also be published today. The authors are Paola Villa, Sylvain Soriano, Tsenka Tsanova, Ilaria Degano, Thomas Higham, Francesco d'Errico, Lucinda Backwell, Jeannette J. Luceiko, Maria Perla Colombini and Peter Beaumont.